Fallon said "Worth the wait." It hasn't been long since Lil Wayne dropped Tha Carter V album. Weezy made a guest appearance on The Tonight Show starring Jimmy Fallon to answer some questions and do a quick performance. Tunechi talked to Fallon about the legal battles he delt with the delay of the album release. 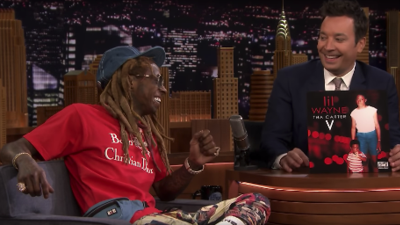 Wayne tells Fallon, "It was business, kinda over my head at times. I'm a real musician. I'm an artist." The 36-year-old hip-hop musician tells Fallon about his love for skating and how he passed the time by working, caring for his four kids and his music. With the help from Jimmy Fallon's house band The Roots, Lil Wayne performs "Dedicate" in front of a live studio audience.